Figure 7-1. - Proper drainage for storm water. float-controlled electric pump. Drain tiles should generally be pitched from a high point around the perimeter of the building to a low point below the floor slab where the sump and pump are located. Where roof drainage causes a foundation water problem, gutters and downspouts should be installed, preferably connected to a storm sewer. Gutters that are improperly hung or allowed to become clogged will overflow and lose their effectiveness. Leaks in gutters should be repaired promptly. 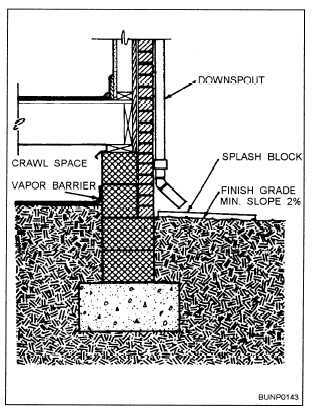 Splash blocks or drain tiles should be installed in the absence of storm sewer connections to prevent pooling of water below downspouts. The drainage of surface water toward a building can be reversed by sloping the ground surface away from the foundation wall. Where that is not possible, ditching or installing drain tiles will serve the same purpose. The general grade of crawl spaces should not be lower than the surrounding area that should be graded to drain away from the building. Foundations are subject to deterioration whether from material or construction deficiencies or from environmental conditions. The deterioration of foundation materials must be observed directly unless the effects are severe enough to cause foundation settling. Excessive moisture from surface or subsurface sources is a major cause of timber deterioration, providing the necessary condition for wood decay and encouraging insect infestation. Improperly seasoned wood is subject to cracking, splitting, and deflection. Concrete and masonry are subject to cracking, spalling, and settling, particularly under adverse ground and climatic conditions. Steel and other ferrous metals are subject to corrosion in the presence of moisture and sometimes by contact with acid-bearing soils. Signs of corrosion are darkening, rusting, and pitting of the metal. Corrective actions taken to alleviate the deterioration of the foundation materials given above are covered in detail later in this chapter in the section dealing with the maintenance and repair of waterfront structures. Considerable deterioration extending from the foundation to the building superstructure can be caused by neglect of crawl spaces, especially in climates where it is necessary to enclose the space to maintain comfortable floor temperatures. Unventilated crawl spaces contribute materially to rapid absorption of moisture into structural wood and other materials, and the spaces soon become a natural habitat for fungus growth and termites. Sills, joints, and subflooring may be affected by wood decay. Condensation may occur in the studding spaces above the floor level and cause paint failures. Crawl spaces should be carefully checked periodically. In checking these spaces, ensure that they are clean, clear, and accessible. An accumulation of rubbish in the space may provide a natural harbor for insects and rodents as well as impede access and possibly interfere with drainage. Scrap wood is a clear invitation to termites. Look for disorganized storing of any material in crawl spaces. Also, check for accumulations of water that may breed mosquitoes, cause fungus growth, and weaken soil bearing under footings. Ensure that all ventilation openings are covered with suitable hardware cloth or copper screening to prevent entry of birds and rodents. In addition, see that access doors to crawl spaces are provided with a suitable padlock and kept closed.